PCE Splatterhouse in 12:12.61 by EZGames69. Rick and his girlfriend Jennifer enter West Mansion (known as Splatterhouse) to study Dr. West's parapsychology teachings for a school project. After a flash of lightning and a scream, Jennifer is gone, and Rick is left wearing the Terror Mask, which gives the wearer great strength. 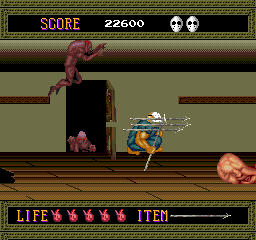 Splatterhouse is the first game in the series, but only the second game to appear on a home console (after Splatterhouse: Wanpaku Graffiti on the Famicom), which was later continued on the Sega Genesis. This run is an improvement of 3.10 seconds over the previous work by Samsara. The improvements comes from better optimization and some slightly better boss fights. Note: The movie file plays well on both region versions of this game, so we provide encodes for both of them, since they have significant differences. The first encodes feature the Japanese version, whereas the second ones show the American version, which had all religious references removed and the colour of the mask changed to red (and its form changed).